This is the latest book written by Milton W. Hourcade and his first in English. Along 172 pages, and with a selection of pictures, the author reviews the whole UFO subject and comes to a proposal for a new Ufology. The book presents a serious approach to the UFO phenomenon, from a scientific standpoint, looking for a new way to solve the mystery. It includes a review of the famous Socorro, NM incident, followed by an interview with Dr. Jill Tarter (SETI). Dr. MassimoTeodorani, an Italian astrophysicist, contributes a report about the Hessdalen Lights as well as his his fully loaded scientific paper on "Physics from the UFO Data". The book concludes with a retrospective and prospective look at Ufology, and a proposal for a new approach to the study of UFOs. Currently the book is available from the Editorial AuthorHouse, either printed or as an e-book. Visit http://bookstore.authorhouse.com/ and search for the title of the book. The soft-cover version cost is $ 10.99, and the Web version is $ 9.99. 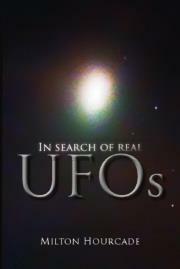 A must read for anyone seriously interested in UFOs.